They're renting out historic spots near St. John's Episcopal Church, a carriage house near the University of Richmond, a "Japanese-style room" close to Virginia Commonwealth University and a modern guesthouse in Forest Hill with surround sound and keyless entry, which "allows luxury of limited interaction." Whatever hotel ill will and tax ambiguity might exist over private-residence rentals, Richmonders have flocked to Airbnb. Tourists can rent camp space by the river, places with big-screen movie rooms, a getaway house with a hot tub and a party mansion apartment that goes for $69 a night. Christian's Smallest Room on the Farm rents for $25 a night. It's billed as "cozy, clean and quiet," is five minutes from the airport and targets "travelers, backpackers, students on a budget" as a key demographic. You get the full run of the house, fields with purple clover and in the summer, the side porch is "a great place to sit and watch the corn grow." How about a little community service with your stay? The Richmond Urban Ministry Institute runs a shared spot for 16 or more students, teachers and missionaries. For $75 a night, you get training, two meals and transportation to service projects: "opportunities to experience firsthand outreach to Richmonders living on the margins." Ivan and Debra offer up a tourism bonus for guests who stay three or more days in their $50-a-night North Side rancher. Along with the room you'll get an SUV tour of the canals, the State Capitol, Monument Avenue and St. John's Episcopal Church. "Along the way, guides share stories about the city's history, landmarks and architecture." In Chesterfield County, Norm rents a spot at his 1930s farmhouse, Dart Acres Farm. Chickens included! Plus gardens, a fire pit and a friendly dog. Is your budget less of a concern? Check out Debbie's River Ridge on the James in Charles City County. Five bedrooms, five and a half baths and a pool house -- $1,250 a night. Upside: It's next to Upper Shirley Vineyard. There's a "view of Presquile Wildlife Refuge, sunset and eagles," and you can hang out at the Tiki bar on the boat dock. 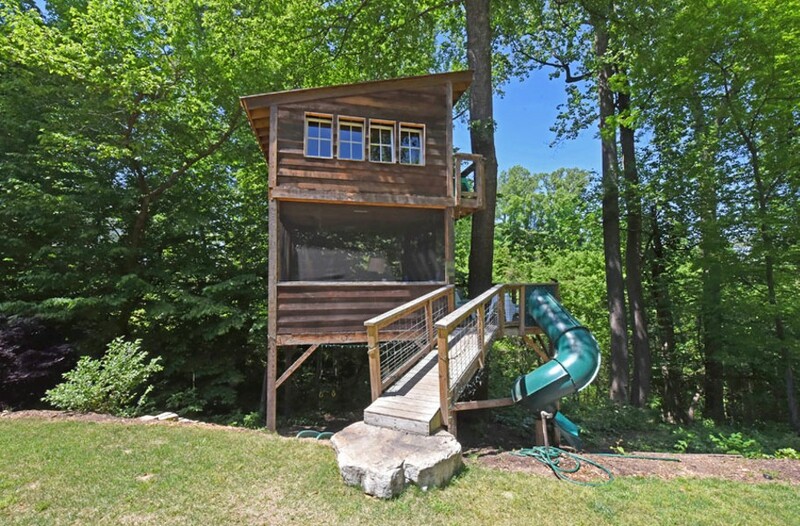 Carrie's two-story Trailside Treehouse, on the south side of the Boulevard Bridge, offers an upscale campout vibe. It "was designed by renowned Richmond architect Henry Tenser, and modeled after a western firetower," the listing says, and is on the property of the hosts' modern home steps from the Buttermilk Trail.